A very easy recipe when you just can’t get the knack of making a full pie… I always have a problem of trying to get the top to meld thoroughly with the base. Remove the inside of each apple with a spoon very carefully, as to not puncture the peel. Remove skin from 2 additional apples and slice very thinly. 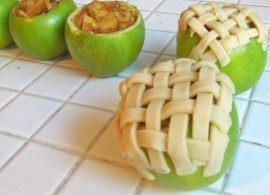 These apple pieces will give you filling needed to fill the four apples you are baking. Mix sliced apples with 2oz of the caster sugar and the brown sugar and cinnamon in a bowl. If you prefer more or less cinnamon and sugar, make adjustments as desired. To prepare the pastry, crumb the butter and flour together in a bowl by hand. Add the remainder of the caster sugar (1oz). Mix in the egg and a little drop of milk to form a dough. Place apples in an 8×8 pan. Add just enough water to the cover the bottom of the pan.